Golden State is employing Moneyball-style analytics, a groundbreaking farm system, and true grit on its way to its second playoff appearance in nearly two decades. 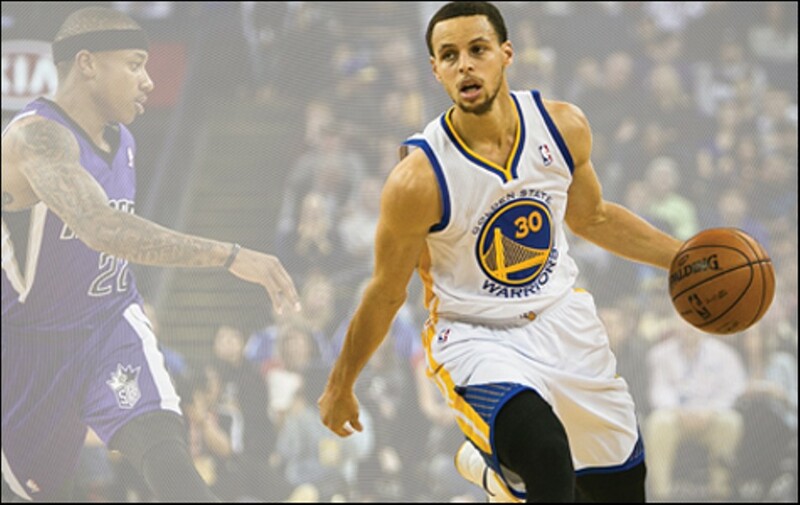 Stephen Loewinsohn Guard Stephen Curry is the NBA's second-leading scorer since the All-Star break. 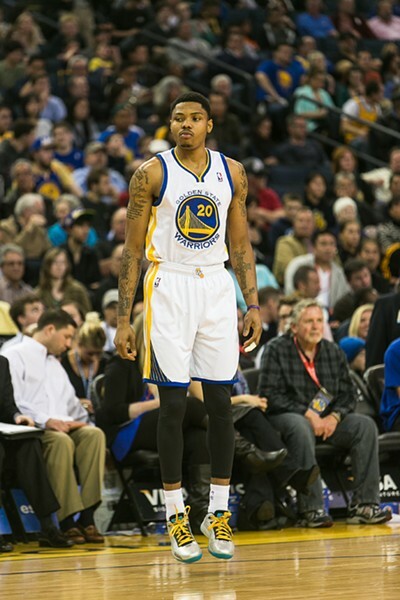 Stephen Loewinsohn Hard-working swingman Kent Bazemore may be the real face of the franchise. 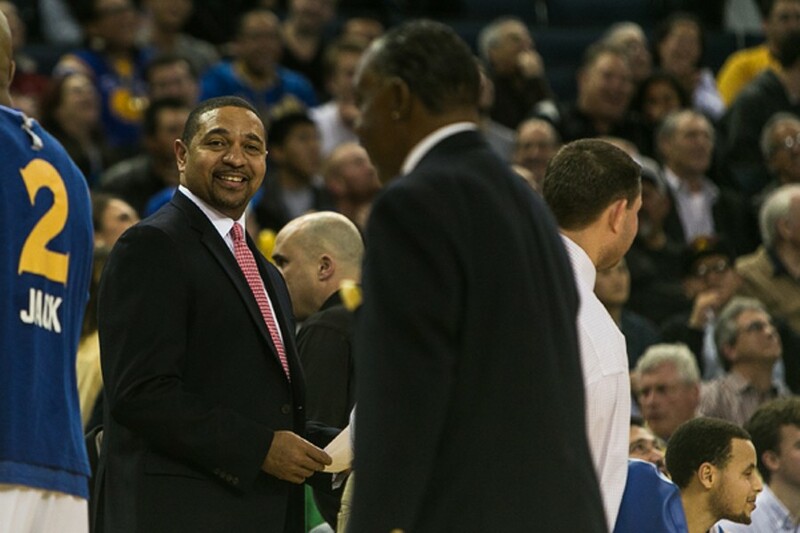 Stephen Loewinsohn Head Coach Mark Jackson says the team must outwork and out-hustle its opponents. This article won first place for best sports story from the 37th Annual Greater Bay Area Journalism Awards in the non-daily print division. The Oakland boos rained down like Stephen Curry three pointers — high, heavy, and well-aimed. It was March 2012, and it was supposed to be a celebration for the much-loved Warriors legend Chris Mullin. But as the team prepared to retire Mullin's jersey, the fans loudly harangued new co-owner Joe Lacob. Golden State Warriors Hall of Famer Rick Barry stood in the shower of disgust at Oracle Arena's center court with a microphone in his hand, dumbfounded. "Seriously," he said. "C'mon people." But it wasn't hard to understand where Warrior fans were coming from: Lacob's brain trust had just traded explosive guard and leading scorer Monta Ellis and two other players for the injured Andrew Bogut. The fans, however, weren't seeing the big picture, and obviously didn't realize that a year later, the new-look Warriors would be vying for their second playoff spot in the past nineteen years. The old Warriors won — or more often lost — with exciting guard play, outside shooting, and occasional iffy character. The new Warriors, by contrast, have won games this year with depth, defense, rebounding, and — wait for it — character. The Warriors also are not building a team that hopes to merely win on the road, make the playoffs, and send players to the All-Star Game. With everything from Moneyball-style analytics to a groundbreaking farm system, Golden State is building an organization that's designed to win championships with guts and hard work. In fact, the Warriors' lone All-Star this season — David Lee — isn't the real face of the franchise. A case can be made that it's not Curry either, even though he's the NBA's second-leading scorer since the All-Star break. Instead, the player who perhaps best exemplifies the team and the changes its made is an undrafted rookie who isn't known for his production on the floor but for his dramatic productions on the sidelines following Curry buckets. But so it goes with a team that's suddenly the most progressive in the National Basketball Association. As of Monday, the Warriors were in a strong position to make the playoffs, ranking sixth among eight teams in the Western Conference that will reach the postseason. But to best see where these Warriors are headed you have to look in less obvious places: not the big win at Miami at the buzzer, or the blowout over the Lakers last week, but the closing minutes of a particularly nasty loss. A low point in the Warriors 2012-13 season was a hideous March 15 home fail against Chicago that included an informal Bulls dunk contest, a gross Andris Biedrins free throw, and the biggest home deficit of the season (36 points in the fourth). But from that ugly puddle sprang a glimpse of the future. Late in the game, swingman Kent Bazemore flew from one end of the floor to another, applying pressure that twice made him Colonial Athletic Association defensive player of the year at Old Dominion. 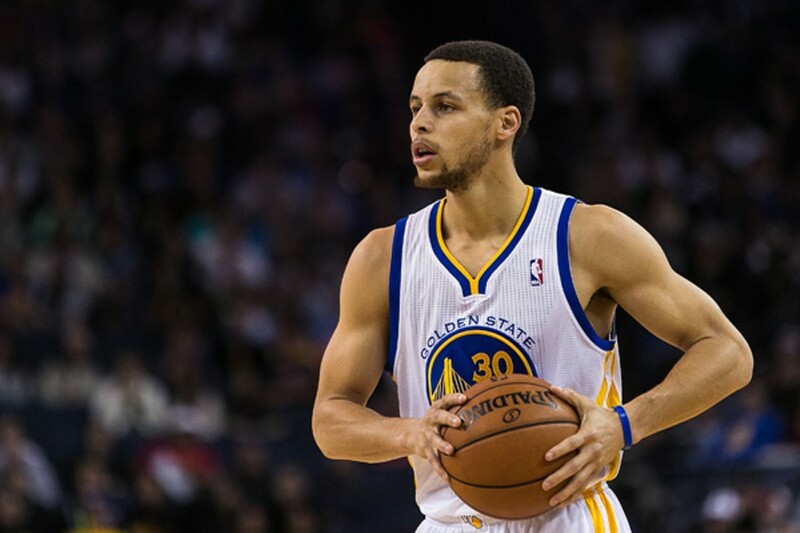 He repeatedly beat defensive stopper Luol Deng for buckets as the Warriors slashed their huge deficit in half. Bazemore similarly confounded standout wingman Manu Ginóbili in San Antonio a week later. A rookie who schools crafty veterans is uncommon. Much rarer: an undrafted rookie doing it to playoff-bound All-Stars late in the season, after only a handful of NBA minutes. A key reason for Bazemore's success? He's been driving up and down I-880 and Highway 17 to and from Santa Cruz, where the newest Warriors play in the NBA Development League. This winter, the 2,500-seat Kaiser Permanente Stadium shot up as quickly as a six-foot-five Bazemore on a lob, after the Warriors bought the Dakota Wizards and moved them to within an hour-and-a-half drive of the Oracle Arena. Now, younger, inexperienced players can practice with the big leaguers in the morning, and blossoming players like Bazemore in need of reprieve from the big-boys' bench can get valuable playing time in Surf City at night. "It's a huge advantage," said Joe Lacob's son Kirk, who is Santa Cruz's general manager, referring to having a farm team nearby. "Baseball's been doing it for a hundred years. It's one thing to learn to play the game, it's another to learn to play through action and to learn to play the way a particular organization wants you to play." Indeed, it's no coincidence that Santa Cruz Warriors President Jim Weyermann comes from baseball — and not only that, but from an organization that harvested maximum yield from its seedlings. Ten players from the San Jose Giants — the San Francisco Giants' farm team — later won World Series rings. Under Weyermann's watch, the San Jose Giants were named the best farm organization in the country. And not only do Golden State and Santa Cruz share the same mascot name (like the San Francisco and San Jose Giants), but Santa Cruz's players also run the same plays with the same names as the big league club, allowing players moving up or down a chance to come in and contribute immediately. "The club provides coaching staff tremendous flexibility, and game time for those who need it most," Weyermann said. "You can't duplicate the speed of a game in practice." Another unique Santa Cruz quality: oceanside views from player suites — a perk not available for players assigned to the Reno Bighorns, Fort Wayne Mad Ants, or Canton Charge. "It's designed in our strategy," Weyermann added. "What people don't understand with players and free agents is that there's a ripple effect. If they're talking about Golden State's D-League players in suites over the ocean, it makes a statement about an organization."